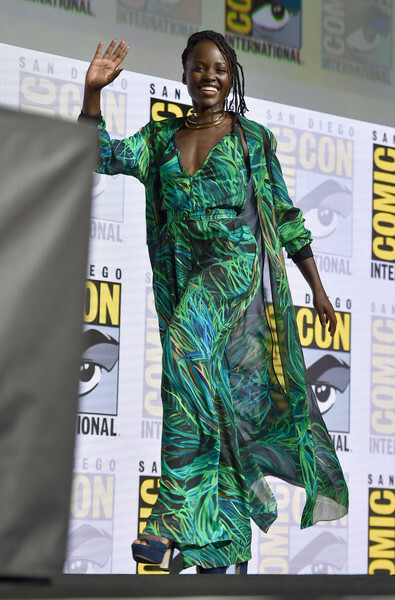 Actor Lupita Nyong’o from Marvel Studios Black Panther’ at the San Diego Comic-Con International 2017 Marvel Studios Panel in Hall H on July 22, 2017 in San Diego, California. *Lupita Nyong’o says she is “honored” to be part of a hotly anticipated heist film with Rihanna that folks on social media tweeted into existence. Other Twitter users took that concept and ran, eventually calling on “Insecure” writer/star Issa Rae to pen the script and “Selma” director Ava DuVernay to call the shots. Soon, all four women said they were interested in making the fantasy movie a reality. Appearing at Comic-Con Sunday to promote the forthcoming “Black Panther,” Nyong’o said the Marvel film has something in common with the heist movie.